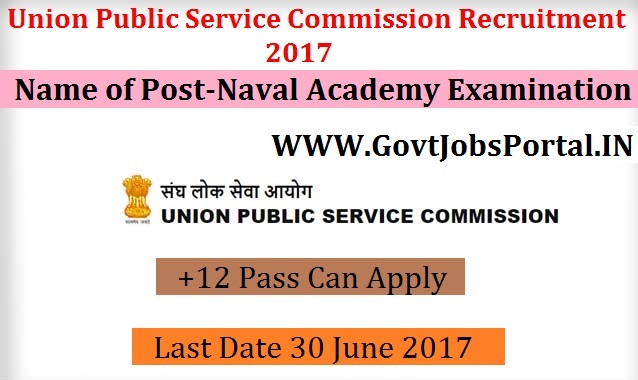 Union Public Service Commission is going to recruit fresher candidates in India for National Defence Academy & Naval Academy Examination (II), 2017Posts. So, those candidates who are willing to work with this organization they May apply for this post. Last Date of Apply 30-June-2017. Total numbers of vacancies are 390 Posts. Only those candidates are eligible who have passed 12th Class pass of the 10+2 pattern of School Education or equivalent with Physics and Mathematics conducted by a State Education Board or a University. Indian citizen having age in between 18 to 32 years can apply for this Union Public Service Commission Recruitment 2017. Educational Criteria: Only those candidates are eligible who have passed 12th Class pass of the 10+2 pattern of School Education or equivalent with Physics and Mathematics conducted by a State Education Board or a University. 2: Selection will be held on Intelligence Test.